The Tomb Raider series has always pushed the envelope technologically… the original release in 1996 was the first 3D game many players ever tried. It makes sense that the latest installment, Shadow of the Tomb Raider, would employ a wide range of cutting-edge NVIDIA features on PC. We talked with Jurjen Katsman at Nixxes to get thoughts on the benefits that come with playing their new game on PC. Shadow of the Tomb Raider is among the very first wave of titles supporting ray tracing. Why was it important to jump in right away? One of the benefits to gamers of playing on PC is to be able to use the very latest hardware. So as part of our responsibility of bringing Shadow of the Tomb Raider to PC it is important to us to stay at the forefront features offered by this latest hardware, and ensure our games take full advantage of it. Shadow of the Tomb Raider features gorgeous set-pieces that often prioritize shadow and darkness over light. How has real-time ray tracing helped you get the results we see in the video? The importance of shadows and how they interact with light in the game is certainly why using real-time raytracing for shadows was what we have focused on, it allows us to use additional shadow casting lights that can make all the detail in the environment stand out more, and to have more realistic software shadows as well where appropriate. Do you have any tips for development teams that are adding real-time ray tracing to their art pipeline? One of the big lessons we learned is that the best uses of ray tracing are the ones which you wouldn’t be able to practically solve in other ways. When using shadow maps, many small point lights that cast a shadow are impractical, and would be really expensive. With ray tracing this suddenly is no longer a problem. The amount of lights becomes a lot less important, with their overall size on screen being the major factor. On the other hand, if you already have a good reflection algorithm that works in screen space, and the type of visuals in your game do not make the potential artifacts very visible, not much is gained by using the available ray tracing power to replace that. How do you think real-time ray tracing will change the way games are made? Ultimately ray tracing does not majorly change _how_ games are made. And this is a good thing. Ray tracing is a very fundamental switch in terms of what work we ask the GPU to do, where it can not just read pixels from 2D images, but also evaluate rays which are casting into any possible direction in a complicated 3D scene. But all the core building blocks for games and the tools used to create them are still the same, so there is no significant re-training needed. It does mean engine developers have new tools available to make them look better than ever, and to invent new algorithms which leverage the new hardware features. In the last few years more and more graphics algorithms have been created that attempt to ‘fake’ ray tracing by ray-marching in screen space. For example Screen Space Reflections, Screen Space Ambient Occlusion, Screen Space Contact Shadows, and many more. Algorithms like those have had a major part in making games look as amazing as they do now, but ultimately all suffer from artifacts. As ray tracing starts being used more and more I expect all of those to disappear and be replaced with ray traced implementations instead. Let’s talk about DLSS. How does anti-aliasing via deep learning differ from traditional techniques? DLSS is truly quite magical in how it works. 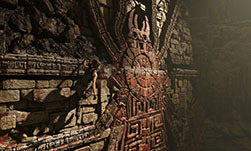 Just like how we as humans can make the distinction between an aliasing artifact, or detail that got lost as a result of limited resolution, the DLSS machine learning based algorithm, trained on tens of thousands of frames of our game being played, can detect these artifacts and produce an enhanced image. And where other AA algorithms can often result in a more blurry image, and come at a performance cost, DLSS can actually add more detail, and as a result does not need as many pixels to be rendered, resulting in improved performance. Are you using DLSS for better image quality, better performance, or both? Which is the priority? Like with all anti-aliasing algorithms it really comes down to personal preference. DLSS to me provides image quality superior to many other AA algorithms, while at the same time increasing performance. That is a hard combination to beat. But if you have GPU power to spare you may prefer some of our other traditional AA options, which in some cases can give you a slightly sharper image, but at a higher performance cost. That’s the great thing about PC, everyone has their own hardware and their own personal preferences, and we can all customize the game just the way we like. Shadow of the Tomb Raider uses tessellation for enhanced geometric detail. What performance benefits did you see with its inclusion? Tessellation we have used before on earlier Tomb Raider games, but for each one we tried to find more ways to use it to enhance the quality of the image. It is not aimed at improving performance, but because the amount of geometry it generates is dynamic, it does allow us to create a lot of additional detail without a high performance impact or consuming a lot of memory to store this geometry. Can you tell us what CHS is, and how it allowed you to produce realistic shadow falloff? How does that work alongside ray tracing? CHS stands for Contact Hardening Shadows. In real life, shadows (for example from the sun) are very sharp when they are seen very close to the object casting the shadow. But when the distance between those is larger the shadow becomes more and more blurry. The combination of both these sharp shadows and these blurry shadows appearing just in the right spot can significantly enhance realism. Our CHS solution is aimed at creating this effect when using traditional shadow maps, but when using ray tracing the physical properties of the lights, including their size, and the multiple rays we cast for each pixel, automatically result in this effect being visible. SSCS is another technology you’ve taken advantage of in Shadow of the Tomb Raider, which allows for enhanced surface definition. Why did you decide to add this technology to your stack? Screen Space Contact Shadows can generate subtle detailed shadows which traditional shadow maps cannot properly represent due to resolution issues. But those subtle shadows do make the depth of the image more apparent and cause small details on surfaces to stand out more. This is also a feature that was made necessary by limitations of shadow maps, but with the use of ray tracing is now no longer needed, and we disable it on lights that use ray tracing to determine their shadows. Finally, HBAO+… how does that technology help you with ambient occlusion? Ambient Occlusion is critical for a realistic image, and HBAO+ offers extremely good results at a very reasonable cost. We are very happy to be able to offer this option to our players on PC, leveraging all the research NVIDIA has put into it, while we can focus our own research on other areas.